With the Good Friday long weekend just around the corner, I couldn't resist but sign myself up for a cooking class conducted by a distinguished French chef. With the exception of the escargots (which I still lack the guts to try), all the other dishes sound darn good to me! Better still, there will be complimentary wine served during the class. Christmas hit Singapore early this year. Santa Claus (in the form of Ferran Adrià) is coming to town. 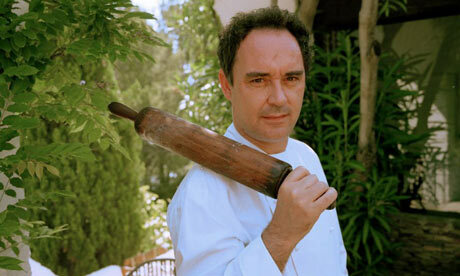 Probably one of the most celebrated chefs in the world, this marks Adrià's first engagement in Asia. He will not be cooking but will instead be presenting a special documentary aptly titiled "A Day at El Bulli", offering attendees an insight into his ideas, methods and creativity. Filled with countless behind-the-scenes look at the restaurant and kitchen and interesting anecdotes, this event will make your day at El Bulli worthwhile. Many a food lover have harbored dreams of visiting El Bulli one day. Many describe it as a "once in a lifetime" experience. It thus came as a shock when Adrià announced his intention to close El Bulli from 2012-2013. Hubby and I are fans of Chili's. Ever since it opened in Tanglin Mall last year, we've been going there for our fix of nachos (with guacamole dip) and chili almost once every fortnight. Unfortunately, being Eastlanders, Chili's is quite a far drive away for us and Orchard Road traffic on weekends can be quite a turnoff. We thus have to contend with perpetual Chili cravings all the time. This week, after a particular draining workday, we experienced Chili pangs again. Out of the blue, Hubby suddenly suggested Wendy's -which is only a stone throw away from my office in Raffles Place. Wendy's doesn't have nachos and isn't a fine dining restaurant but at least it serves chili. Plus we hadn't visited the place since its much publicized opening in Lau Pat Sat. Even at 9pm, the place was almost full, resembling a typical fast food outlet. The Wendy's mascot is cute but looks a tad out of place with her fire-engine red hair. I ordered a bowl of Chili, a 3-piece nugget set and a half pounder cheese burger meal (comes with fries and a drink) for both of us. Service was brisk and efficient. Better still, the final bill came up to under 14 bucks- which is really great value. The Chili served at Wendy's was definitely inferior to the one served at Chili's- but it was a decent substitute nonetheless (and much cheaper at only SGD2.50 a serving). I enjoyed picking out the stewed beans and savoring the richness of the stock. Hubby's burger came all wrapped up in a silver foil, which made it look like a bar of Willy Wonka Chocolate with a golden ticket hidden within. The final product didn't look anything like what was featured in the adverts but it was tasty nonetheless. Fries were thick and slightly soggy. Even a fry-lover like me had difficulty finishing the whole portion. I wonder if I could have substituted the fries with a baked potato instead. (I heard Wendy's version is pretty good). We left with a good feeling in our bellies. Whilst Chili's still remains our favorite joint, we do not mind visiting Wendy's again for a quick fix. I almost forgot how a good buffet should really taste like. That is, until I went back to The Line for dinner last week. It was like a jolt back to reality. This is how ALL buffets should taste. Mashed potatoes that make my heart sing. Deep fried crispy baby squids. Love at first sight and first bite. Yorkshire pudding and roast beef with brown gravy. A perennial British favorite. Heavy but satisfying. A close up of the spongy yorkshire pudding which goes wonderfully with the mashed potatoes and reminds me (for some weird reason) of Popeye's biscuits. Click here for Gordon Ramsey's recipe. Glorious sticks of satay (beef, chicken or mutton) which were a crowd favorite. The accompanying peanut sauce is to die for. Herbal prawns- a must-try. The prawns were huge and their meat sweet and succulent. My very own personalised kway teow "ta" topped with enoki mushrooms, dumplings and quails eggs. The combi almost killed me..too much chilli! Dessert was an equally lavish affair. Even the thought of it is making me salivate. Ladies and gents, I present to you the Ultimate Crepe. Prepared ala minute. The final product. Doesn't it look like a huge thosai? Eat it on its own or with a generous ladle of mixed fruit. Either way, it tastes delicious. A chocolate fondue tower to oogle at. A kid magnet. A bouquet of marshmallows for your thoughts? If you still have space, don't forget to try The Line cake. Its not named after the restaurant for nothing. For me, a slice of kueh lapis with a cup of hot tea is a must-have before I consider a meal complete. The Line's version did not disappoint. The funny chocolate cake beside it however was dry and unappetising. All in all, it was a very enjoyable dinner. Service was friendly and good (I like the fact that there's a service staff stationed beside almost every dish to ensure that a certain level of quality is maintained at all times). Food was excellent. Although the 38% discount did defray some of the cost, this is still not one meal you can afford to eat everyday. I'm already looking forward to my next visit! Everday, I try to learn something new. Today, I thought I'd share what I've learnt -FAT is the new sixth sense! How often does one come across a local play which mixes the love of art with the love of food? This is one opportunity not to be missed! Indulge in a scrumptious double bill of two brand new Singapore plays by two of the country’s most celebrated playwrights! 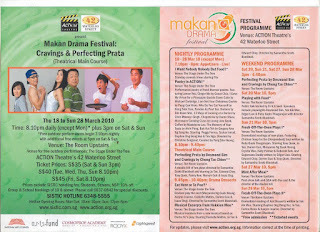 Cravings and Perfecting Pratas are the theatrical main course of Makan Drama Festival, an inaugural theatre event inspired by Singaporeans’ greatest loves – food and eating! They will be performed in The Room Upstairs, an intimate theatre in a beautifully restored pre-war bungalow amidst tropical garden in the heart of Singapore’s civic district. Your ticket to this double bill will also entitle you to free admission to all outdoor performances during the Festival. 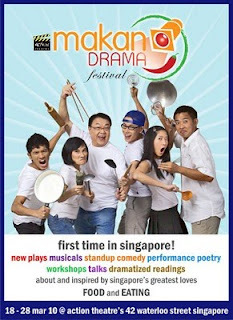 These include standup comedy about Singaporeans’ culinary obsessions, performance poetry of food-themed poems, dramatized readings of fresh-off-the-oven plays, fun talks by thespians and drama gurus, musical excerpts from Hokkien Mee – The Musical plus a brand new devised play Eat Here or Ta Pao? CRAVINGS: Written by Chong Tze Chien, prize-winning playwright of PIE and Furthest North, Deepest South, Cravings is a hilarious play that also takes a delicious dig into couplehood and marriage. This refreshing comedy drama is about a young husband who craves for a candlelit dinner and a passionate evening with his own wife - after having "lost" her for 9 full months during her pregnancy with their first child. Their hilarious “obstacles” include the nosy in-laws with their very own cravings! PERFECTING PRATAS: by Desmond Sim Perfecting Prata by Desmond Sim, award-winning writer of Drunken Prawns and Autumn Tomyam, tells a comic yet moving story of a teenage Chinese-Indian boy who sets out to learn how to make perfect roti pratas from his Chinese father in order to impress his girlfriend. Smartly integrating food, humour and hearty moments, the play addresses what it takes to blend and balance opposing flavours in food and life. Directed by Life! Theatre Award winner Samantha Scott-Blackhall, this tasty double bill stars a cast of veterans as well as newcomers including Jo Tan, Edward Choy, Tony Quek, Fanny Kee, Mervyn Goh and Issac Ong. Hubby is in this fitness craze now so I've been eating quite abit of soy-based products lately in a bid to maintain an equally healthy lifestyle. Last week, I had the good fortune of picking up some invaluable Tau Huey making skills from an uncle. Making it was such a cinch and so much fun that it would be a crime not to share the recipe. 1. Blend 100g of beans and 450ml water at high speed till well combined. 2. Strain the blended contents through a coffee sock or porous linen bag and collect the liquid in a pot, leaving the soy residue in the bag. Squeeze the residue for more liquid. until no more liquid can be extracted. 3. Put the dry soy residue back into the blender, add 450ml water and blend at medium speed till well combined. 4. Strain the blended contents again through a coffee sock or porous linen bag and collect the liquid in a pot, leaving the soy residue in the bag. Squeeze the residue for more liquid. until no more liquid can be extracted. Discard the residue. 5. Repeat Steps 1-4 two more times such that all the strained liquid is consolidated into one pot. 7. Use a spoon/skimmer to dish out the bubbly scum on top of the boiled liquid. Throw away the scum and the knotted pandan leaves. Thereafter, put the pot of liquid aside. 1. Boil 300ml of water. When boiling, add 400g rock sugar and 2 knotted pandan leaves and stir continuously. When sugar has fully dissolved, off the fire immediately and discard pandan leaves. 2. Cool liquid and store in a bottle. 1. Pour Contents (A) into a thermal warmer. Then pour (B) in. No further stirring required. 2. Place a cotton cloth between the pot and the lid of the thermal warmer for 10 mins. Then remove the cloth, put back the lid and leave the liquid to stand for 30 mins. Do not shake the pot. and do not open the lid to check on the contents during these crucial 30 mins. 3. Tau huay should have set and is now ready to eat!